Rodrigo Londoño Echeverri (born January 22, 1959 in Calarcá, Quindío), most known under the nom de guerre Timoleón Jiménez and the nickname Timochenko or Timochenco, is the former leader of the rebel group Revolutionary Armed Forces of Colombia. After finishing high school, Timochenko joined the Young Communists League. He studied at Patrice Lumumba University in Moscow. Timochenko received military training in Yugoslavia. He completed his studies in Cuba. Upon his return to Colombia, those who knew him said he had become decidedly more radical. Londoño joined the FARC in 1982 after being introduced to the rebel group by Miller Chacon. 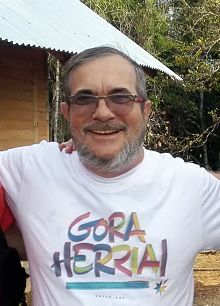 'Timochenko' took over the FARC leadership in November 2011 from Alfonso Cano after the leader was killed by the Colombian army. With more than 30 years of guerilla war experience and a reputation of being a ruthless military commander he "has widespread respect among the rank-and-file, particularly the hardliners that form the core of the rural fighters". According to the Colombian Air Force his alias is referring to Soviet Marshal Semyon Timoshenko. Before assuming the leadership of the guerrilla group, Timochenko was one of the commanders of the Middle Magdalena Bloc of the FARC-EP and was thought to have some 800 men under his command. According to the United States Department of State, Timoleon Jimenez has set the FARC’s cocaine policies directing and controlling the production, manufacture, and distribution of hundreds of tons of cocaine to the United States and the world, including the "taxation" of the illegal drug trade in Colombia to raise funds for the FARC and the murder of hundreds of people who violated or interfered with the FARC’s cocaine policies. According to the U.S. Department of State, in 2000, along with Pastor Alape, he ordered the Magdalena Medio Bloc to retake coca territory, shoot down fumigation aircraft, increase coca production, kidnap United States citizens and kill any farmer who sold cocaine paste to non-FARC approved buyers. The U.S. Department of State is offering a reward of up to $5 million for information leading to his arrest and/or conviction. In 2015, Jiménez suffered a heart attack. In the morning of 2 July 2017, he checked himself into a hospital in Villavicencio after feeling exhaustion and numbness in his arm. Doctors said that he was in intensive care and there was a temporary blockage of blood to his brain. In March 2018, he was hospitalized for acute coronary syndrome and has undergone heart surgery. ^ "FARC appoints 'Timochenko' as new supreme leader". Colombia Reports. 15 November 2011. Retrieved 15 November 2011. ^ a b "Ex-Colombia guerrilla leader hospitalized with chest pain". ABC News. March 1, 2018. Retrieved March 1, 2018. ^ "FARC leader Timochenko hospitalised". News.com.au. 3 July 2017.